Wind energy is the energy from the bulk movement of air. Wind is caused by pressure differences in the atmosphere which are caused by uneven heating of the earth by the sun. Air moves from areas of higher pressure to areas of lower pressure, which produces wind as a result. There are many windy places on earth, and wind turbines are well suited in these places. You often see wind turbines out in the countryside. They are a beautiful sight to many, including myself. Wind power is the fastest growing renewable energy source. It is also the most widely available renewable energy source in the world. Wind turbines can be huge! The height of a turbine tower can be over 100 meters, and the blades can be over 100 meters in diameter. A wind turbine this large can produce several megawatts of electricity, which is enough for a small town. In order for the wind to turn the turbine blades, the blades must face in the direction of the wind. This is done using a special mechanism which detects the direction of the wind and adjusts the blade orientation accordingly. The figure below shows the bulk movement of air past a wind turbine. This movement of air turns the turbine blades which then generate electricity for use in homes and buildings. 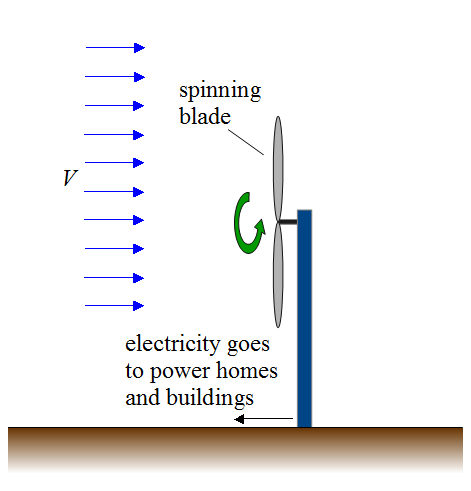 The faster the wind velocity V, the faster the turbine rotates and the more energy is produced. The wind turbine blades are like propellers on airplanes that are running in reverse. When an airplane engine rotates the propeller, the propeller "pushes" the air and the air moves as a result. It does this because of the tilted angle of the propeller blades. In this case the air is reacting to the rotation of the propeller. For a wind turbine, the moving air pushes on the turbine blades, which causes them to rotate. In this case the turbine blades are reacting to the motion of the air. 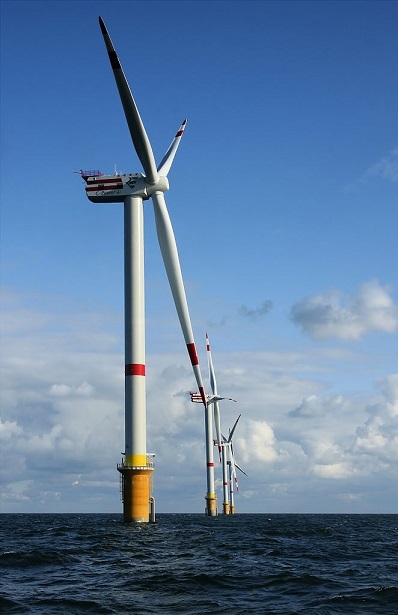 Wind turbines can be installed on land or offshore in a lake or ocean (where winds are usually stronger). If the turbines are installed on land they will not interfere much with the original land use. For example, if wind turbines are installed on farms the land can still be used for growing crops since the space taken up by the turbine is only that of the base, where the tower is attached to the ground. So even though wind turbines are very large, they are mostly out of the way. Very strong winds exist at high altitudes (several kilometers high), so a great deal of energy can be extracted from the wind there. Some have suggested some interesting ways to put wind turbines high up in the atmosphere. The figure below shows one such idea that I came up with, which is highly theoretical I will admit. 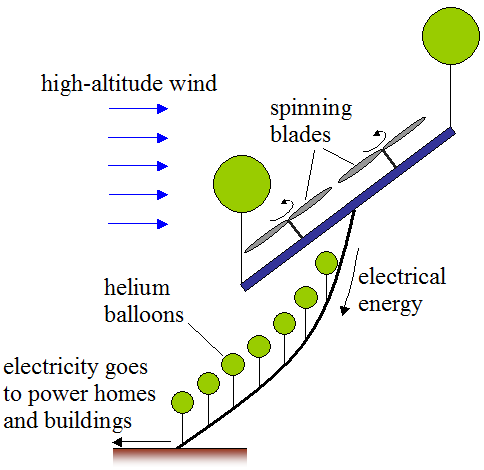 The idea here is that you raise the turbines high up into the atmosphere with large helium balloons (which float in air like hot air balloons) and then maintain the turbines at a certain height where the wind is really strong. You then tilt the turbines, as shown, so that they face the wind and are turned by the force of the wind. This then generates electricity. You'll notice that the cable connecting the turbine to the ground is supported by balloons. It is necessary to do this because such a cable would have to be very long, likely several kilometers, which will make it very heavy. As a result, it will need to be held up by helium balloons as well. The disadvantage of using wind energy is that it is only produced when the wind is blowing. This disadvantage can be overcome with energy storage devices which store the wind's energy when the wind is blowing for use when it's not blowing. An example of these devices are large batteries and pumped storage hydroelectric stations.